We’ve read through Genesis and Exodus and are now turning our attention to Leviticus. Leviticus is an instruction manual for priests. There are times when it may seem repetitive, but it reveals the holiness of God and his gracious recognition of the imperfection of man. The provisions in teh book made it possible for our perfect, holy God to live among the sinful Israelites. It points to our need for a Savior. For those who want to dig deeply, all the sacrifices and feasts point to Christ in some way. In the New Testament, we’re going to read the Acts of the Apostles. I hope you’re continuing in the journey through the Bible. Again, don’t get discouraged if you fall behind…just keep reading. To download a PDF of March’s reading schedule, click here. Well, as we just read in Genesis, Joseph’s family joined him in Egypt. Seventy of them, it reiterates in Exodus 1:5. But after a time, the current Pharaoh that Joseph had served died. And the Israelites multipled rapidly. And the new Pharaoh believed the Israelites were a threat to them. So he enslaved them. You’ll read about all that in Exodus 1. Then you’ll read about how God hears the cry of his people and raises up someone to lead them out of slavery. That someone is Moses. The first half of Exodus is dedicated to the Israelites gaining their freedom from the Egyptians. The second half is dedicated to God teaching the Israelites how to be a people led by God. There is much we can learn about being a people led by God as we read the book of Exodus. We’ll also read the gospel of Mark. Most scholars believe that Mark was the first gospel to be written. Luke (and the book of Acts) were written shortly after Mark’s gospel was written. Then came the gospel of Matthew. In January, we read Matthew’s gospel. It was written primarily to Jewish Christians — people who would already have a strong understanding of the Old Testament about A.D. 70. Mark’s gospel, on the other hand, was written primarily to Roman Christians — people who would not have such a strong understanding of our God and how He interacts with people. It was written about A.D. 64. 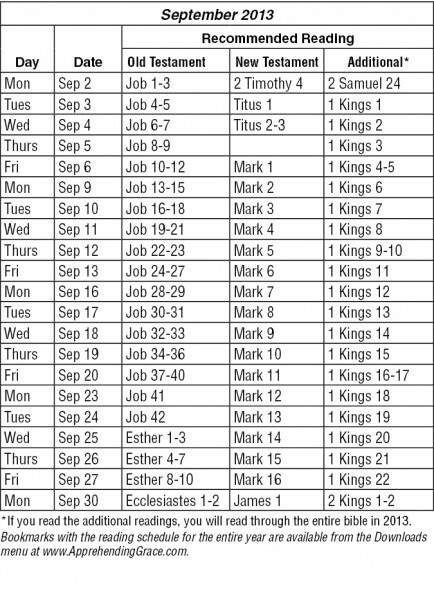 The gosepl of Mark begins to “connect the dots” for the Roman Christians, who would have heard many stories about Jesus, but didn’t understand them in a greater context. You’ll find that it is fast-paced, moving quickly from scene to scene. 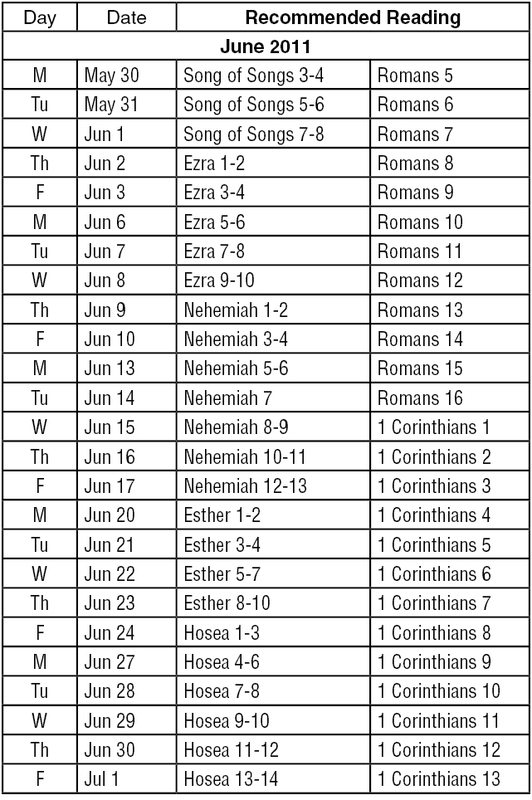 We’ll fill out the month by continuing to read in Psalms. The book of Psalms is actually broken into three sections, called books. We will complete the first book by reading through Psalm 41. Finally, we’ll finish the month by beginning to read the book of Esther. Sounds like a lot of reading! We stay true to our schedule of 4-5 chapters five days a week, so it’s not nearly so overwhelming as it might sound. 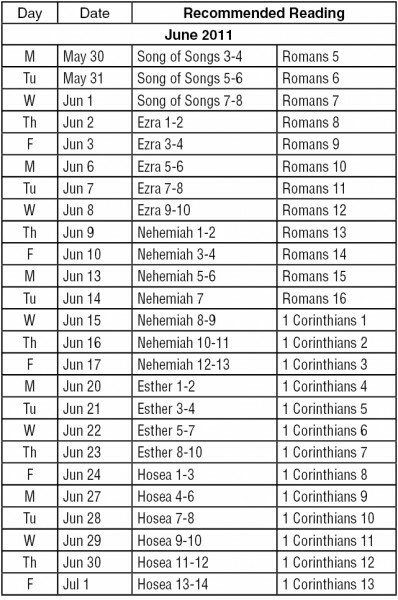 The daily reading plan for February is shown below. If you prefer to download a PDF of the plan, click here. To download a PDF of January’s reading schedule, click here.